New "Golden Ticket" cards featuring the industries first 14-karat solid gold trading cards! 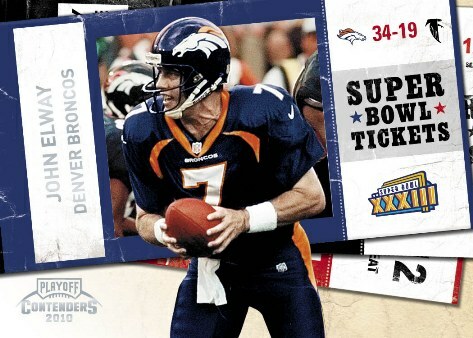 Fresh "Rookie Ticket" design that pays tribute to the legendary set that started it all, 1998 Playoff Contenders! 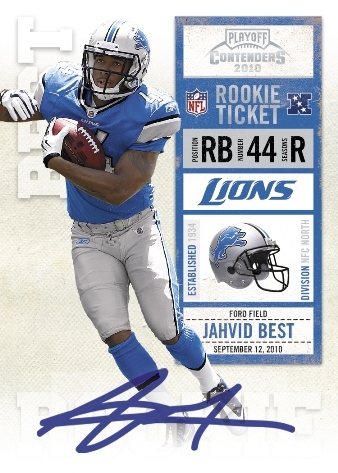 All on-card autographs for RPS Rookie Tickets and Rookie Ink cards! Introduction of new "Super Bowl Ticket" insert set! 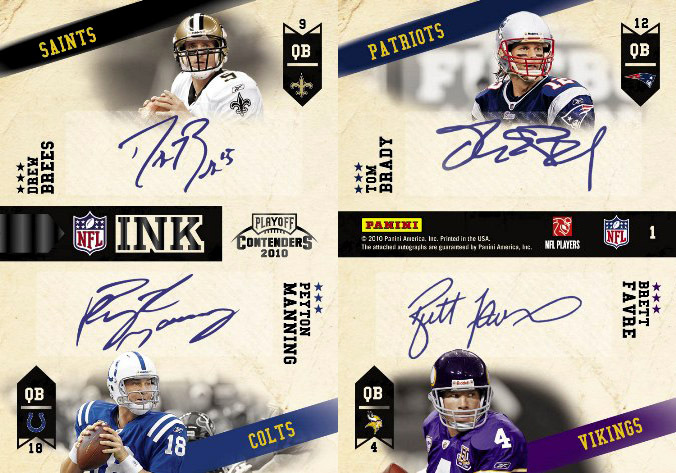 NFL Ink Quads - featuring 4 autographs of gridiron greats on a single cards. One such paring includes Drew Brees, Peyton Manning, Brett Favre, and Tom Brady! Look for Rookie Ticket 1/1 printing plates! Return on Rookie Roll Call, Rookie of the Year Contenders, Draft Class, and Legendary Contenders insert sets! 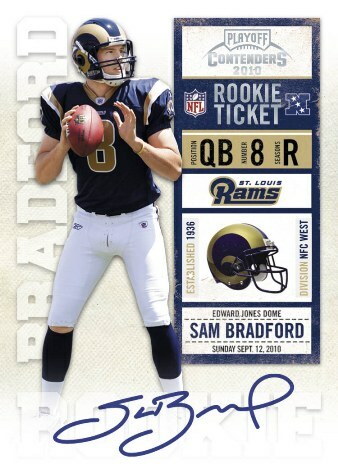 Each case should deliver six on-card autographs of following big time 2010 NFL Rookies: Sam Bradford, Tim Tebow, Ryan Matthews, Jahvid Best, Dez Bryant, C.J. Spiller, Dexter McCluster, Demaryius Thomas, Mike Williams, Ndamukong Suh, Golden Tate, Jimmy Clausen, and Colt McCoy! 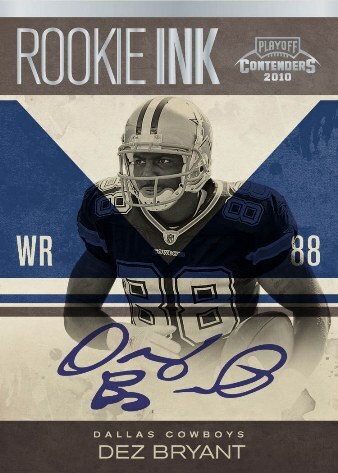 Seek the short prints - feel the excitement of figuring out the shortest printed base rookie autographs! The yearly gridiron right of passage known as "Contenders" returns for another season of high-quality rookie autographs! 2010 Playoff Contenders promises plenty of short print chasing, set building madness come early January. Each 24-pack hobby box delivers 4-5 autographs and a short stack of parallels and inserts. Looks like a good class of rookies! Should be fun year of this product. Great player pics and bold card designs, make this years contenders set my favorite of all time. One of the most elegant looking sets I have ever seen! Base card design is a total improvement over the busy design of last year. A great buy at current prices, where else can you get on-card autos 2/box and 3 additional autos, all in a set that will hold its value because it has “true” rookies, for this kind of price. Hands down, best set of the year!